Democratic presidential candidate Barack Obama on Tuesday urged Gov. Arnold Schwarzenegger to sign a bill that would make illegal immigrant students who graduate from high school eligible for college aid. Schwarzenegger vetoed a similar measure last year. "If Governor Schwarzenegger vetoes the Dream Act a second time, he will compound the immigration crisis by driving thousands of children who are on the right path into the shadows," Obama said in a statement. "We teach our children that in America you will thrive if you work hard and dream big. Governor Schwarzenegger now has the chance to demonstrate that instead of blaming one group for the challenges America faces, he can unite Californians and give children who play by the rules the opportunity to succeed." The bill, which the Legislature approved last month, applies to financially needy illegal immigrant students. They would be eligible for state grants or community college fee waivers if they graduate from a California high school after attending it for at least three years, and only if they are accepted at a California college or university. 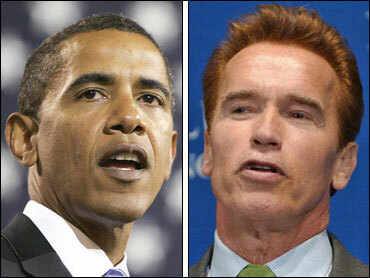 A spokesman for Schwarzenegger said the governor was reviewing the bill. California already allows illegal immigrant students to pay the same public college or university fees as state residents who are U.S. citizens, rather than the higher fees out-of-state students face. But that only applies if the immigrant graduated from a California high school after attending it for at least three years. The students also must apply for legal status. Obama, a U.S. senator, co-sponsored similar legislation when he was a state senator in Illinois.